At Dulcet, we aim to please the refined pallet with freshly baked and scrumptious indulgences. Each box is thoughtfully and artfully created and consists of the finest offering suitable for all occasions. These cranberry muffins are moist, and chock-full of berries, they are light and tasty and so pretty! You can see those cranberries peeking out from under the muffins. These corn muffins are moist, and have a slight sweet taste that's enhanced with whole kernel corn. So delicious! Bursting with fresh blueberries with a tender, cakey crumb sugar crust, these are the best blueberry muffins you've ever had! Behold the perfect banana muffins. They're fluffy and moist and make with fresh, ripe bananas. So good! Looking for the perfect gift they'll love? Looking to complement your breakfast, or dinner? Purchase Dulcet's muffin gift basket today! Always fresh, always loving wrapped and guaranteed to bring a smile to everyone - always! MUFFIN LOVERS - THIS IS FOR YOU! 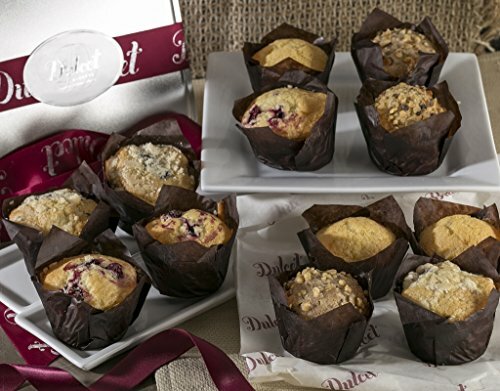 Simply open your Dulcet box and allow yourself to be whisked away on a heavenly adventure: Package includes: Assorted mini muffins: 3 cranberry muffins, 3 corn muffins, 3 blueberry muffins and 3 banana nut muffins. LOVELY PRESENTATION: The muffins arrive neatly tucked into a silver box on elegant coordinating tissue paper, sealed with a maroon ribbon. Your recipients will be brimming as they untie the ribbon to discover those mouthwatering muffins greeting them. GUARANTEED FRESHNESS: The muffins are baked weekly in our bakery. They get baked the same week as delivery to ensure ultimate freshness. They are also individually wrapped by plastic to ensure freshness later on. We take every step to ensure the freshest and most scrumptious indulgences upon delivery. FOR ALL OCCASIONS: When words aren't enough, this classic package will help you express yourself perfectly. Perfect for any meeting, get-together, breakfast treat, or dessert for a family dinner - Makes an ideal housewarming gift or thank you gift. With a package of such tasty and appealing muffins, you just can't go wrong. SATISFACTION GUARANTEED: We are in love with our products, and whoever has tried them feels the same. If for any reason you aren't completely satisfied with your purchase, we'll be there for you. Buy us worry free!